Bitcoin’s (BTC) bulls and bears seem to be stuck in a stalemate, but a decisive session in either direction would likely define the trend going forward. The cryptocurrency was solidly bid above $7,100 about 24 hours ago, reportedly due to speculation the Wall Street bigwigs (Soros and Rockefeller, for example) are set to enter the crypto markets. However, a long liquidation (unwinding of long bitcoin trades), as reported by WhaleCalls, looks to have pushed BTC to a low of $6,611 overnight. At the time of writing, the cryptocurrency is sitting at $6,730 on Bitfinex, representing a 6.38 percent drop from the high of $7,189 seen Monday. Despite the retreat, the immediate outlook remains neutral, with bitcoin stuck within a narrowing price range (seen in the chart below). When viewed against the backdrop of the recent slide from $9,050 (March 24 high), the triangle pattern, representing the narrowing price range, looks like a bearish continuation setup. Hence, a downside break would revive the sell-off from $9,050 and allow a drop towards $5,950 (falling wedge support). Amid the unwinding of the long positions mentioned above, bitcoin created a bearish outside-daycandle on Monday (i.e. 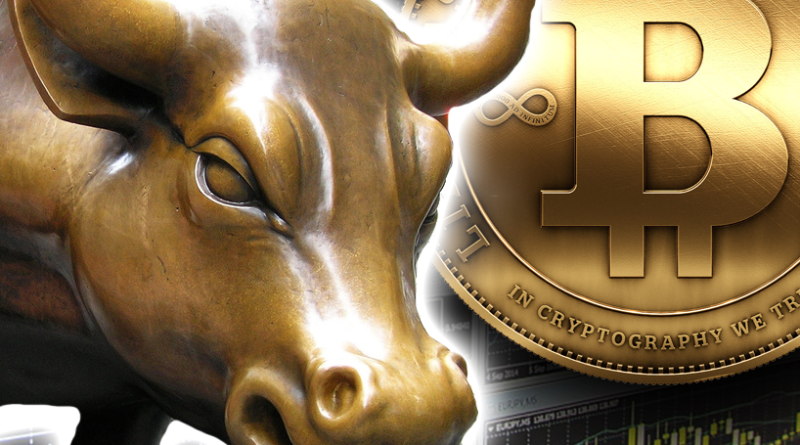 the price action engulfed the previous day’s high and low), indicating that the corrective rally from the Friday’s low of $6,500 has ended. The candlestick pattern suggests that the cryptocurrency will likely breach the narrowing price range to the downside and extend losses towards $6,000-$5,950. On the other hand, if bitcoin breaks out of the narrowing price range with an upside move, the odds of a falling wedge reversal (bullish pattern) would improve. A high volume close (as per UTC) above $7,200 would confirm a bullish falling wedge reversal, however, stiff resistance is lined up at $7,510 (double bottom neckline). As a result, traders would want to see a break above $7,510 before calling a bullish reversal. In such a scenario, prices could rise to $8,500 (target as per the measured height method). Monday’s bearish outside-week candle does suggest scope for a bearish breakdown. A downside break of the narrowing price range (triangle pattern) would open the doors to $6,000-$5,950 (falling wedge support). That said, traders need to watch out for signs of a rebound from the April 1 low of $6,425. An upside breakout of the triangle pattern could see bitcoin chew through supply around $7,200, confirming a falling wedge reversal (bullish pattern) and allowing a rally to $7,500 (double bottom neckline). Only a close above that level would confirm the short-term bullish trend reversal. ← Where’s Bitcoin Price Heading Next — $1K Or $30K?